Ammonia pretreatment is a promising technique for enhancing enzymatic saccharification of lignocellulosic biomass. However, an enzymatic cocktail suitable for the breakdown of pretreated biomass samples is still being developed. The basidiomycete Phanerochaete chrysosporium is a well-studied fungus with regard to bioconversion of lignocellulosic biomass. In the present work, we analyzed proteins secreted by P. chrysosporium grown on untreated and ammonia-treated birch wood meal. Fungal growth, xylanase activity, and extracellular protease activity increased in the media containing the ammonia-treated biomass; however, cellulase production decreased compared to that observed in the untreated biomass. Secreted extracellular proteins were separated by two-dimensional electrophoresis and identified by liquid chromatography ion–trap mass spectrometry. Fifty-five spots corresponding to secreted proteins were chosen for further analysis. In the culture with ammonia-treated biomass, the relative concentration of a xylanase belonging to glycoside hydrolase (GH) family 11 increased, while acetyl xylan esterases belonging to carbohydrate esterase family 1 decreased. Moreover, GH family 10 xylanases were promoted proteolysis in the culture of ammonia-treated biomass, leading to the loss of family 1 carbohydrate-binding modules. These results indicated that P. chrysosporium produced enzymes related to the recognition of structural changes on xylan with de-acetylation and introduction of nitrogen by ammonia pretreatment of birch wood meal. The online version of this article ( https://doi.org/10.1007/s10086-018-1770-4) contains supplementary material, which is available to authorized users. Lignocellulosic biomass, the most abundant renewable organic carbon source on earth, consists mainly of cellulose, hemicellulose, and lignin . Appropriate conversion of biomass offers enormous potential for the production of biofuels and biochemicals. Various pretreatment methods are used to enhance the enzymatic saccharification of lignocellulosic biomass . Among them, one of the most promising approaches for lignocellulosic biomass from grass plants is pretreatment with liquefied ammonia, and this methodology has been extensively investigated [3, 4, 5]. The ammonia cleaves ester bonds in lignocellulosic biomass and generates amides [6, 7]. It has been demonstrated that ammonia pretreatment also alters the polymorphic form of crystalline cellulose with a low water content, transforming the natural crystalline form (cellulose I) to cellulose IIII , which is far more susceptible to enzymatic degradation . Moreover, we have recently reported that ammonia pretreatment is effective for improving enzymatic saccharification of not only grass biomasses but also hardwood biomasses with high xylan and low lignin contents such as birch wood and willow wood . Nevertheless, searching for effective enzymes for the conversion of ammonia-treated hardwood biomass is still under development. Wood-decay fungi are omnipotent degraders of lignocellulosic biomass and the basidiomycete Phanerochaete chrysosporium has been one of the best-studied examples [11, 12, 13]. P. chrysosporium produces a variety of extracellular enzymes including glycoside hydrolases (GHs), carbohydrate esterases (CEs) and oxidative enzymes with auxiliary activities (AAs) to degrade lignocellulosic biomass [14, 15, 16, 17, 18]. The sequenced genome of P. chrysosporium has revealed many genes that encode extracellular enzymes , and the results involving GHs, CEs, and AAs have been deposited into the Carbohydrate-Active enZymes (CAZymes) database . Moreover, extensive proteomic analysis of extracellular proteins, or the secretome, has been performed to map the lignocellulolytic system of the fungus [14, 16, 18, 21, 22]. 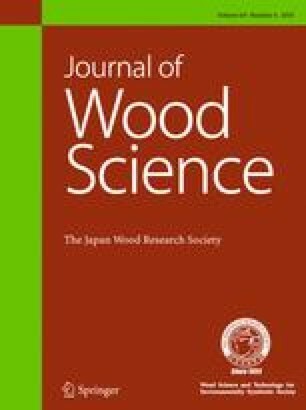 In the present study, we aimed to examine the effect of ammonia treatment on the extracellular proteins of P. chrysosporium to degrade lignocellulosic biomass by performing a comparative secretome analysis of P. chrysosporium grown on untreated or ammonia-treated lignocellulosic biomass from birch wood. The preparation and chemical analysis of untreated or ammonia-treated birch wood meal were previously reported . In brief, a birch wood block was milled, and then sieved to obtain 40-mesh-passed meal. The wood meal was Soxhlet extracted with benzene–ethanol (2:1 v/v) and used for experiments as untreated biomass (UB). UB was treated with liquefied ammonia at 140 °C for 1 h and used for experiments as ammonia-treated biomass (AB). The cultivation of Phanerochaete chrysosporium and enzyme assays were performed according to the method in our previous paper  with slight modifications. In brief, P. chrysosporium strain K-3  was cultivated in Kremer and Wood medium  for 3 days with 2.0% (w/v) UB or AB from birch wood as the sole carbon source. The media were sterilized by autoclaving at 121 °C for 20 min before inoculation. The fungal growth and protein concentration were determined daily. To evaluate fungal growth, 1 mL cultures were collected in a measuring tube and left to stand for 30 min; the volume of sediment was used as a representative metric for the growth of fungal mycelia. The protein concentration of the culture was determined by Bradford assay (Bio-Rad Laboratories, Inc., California, US). Avicel (Funakoshi Co., Ltd., Tokyo, Japan), xylan from birch (Sigma-Aldrich Co., Missouri, US), and azoalbumin (Sigma-Aldrich Co.) were used as a substrate for assaying cellulase, xylanase and protease activities of culture. The amount of reducing sugar released by enzymatic reactions was measured using the p-hydroxybenzoic acid hydrazide (PHBAH; Wako Pure Chemical Industries, Ltd.) method [26, 27]. One unit of cellulase and xylanase activities were defined as the amount of enzyme required to release 1 µmol reducing sugar per min under the assay conditions using a predetermined standard curve obtained with glucose and xylose, respectively. One unit of protease activity was defined as the amount of enzyme required for release of 0.001 Abs at 335 nm per min under the assay conditions. Each conversion data point represents the mean of three measurements with the standard deviation. Statistically significant differences between the two series were assessed by Student’s t test or Aspin–Welch’s t test following an F test assessment of variance. The separation and identification of proteins from P. chrysosporium have been described in detail . In brief, the proteins from culture were separated by two-dimensional electrophoresis (2DE). 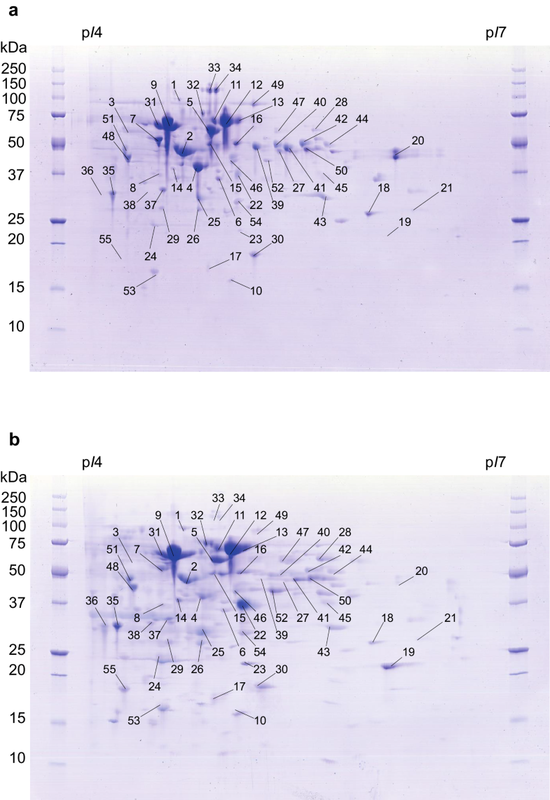 The stained 2DE gels were scanned and individual protein spots on different gels were matched and quantified. Fifty-five spots of protein were digested by trypsin and analyzed by ultra-high-performance liquid chromatography–mass spectrometry. The peptides were identified by an in-house-licensed mascot search engine (Matrix Science K. K., London, UK) with 10,048 annotated gene models from the P. chrysosporium version 2.0 genome database (http://genome.jgi-psf.org/Phchr1/Phchr1.home.html) . The obtained amino acid sequences were analyzed by a BLASTP search against the NCBI non-redundant database with default settings to confirm gene function . P. chrysosporium was cultivated in synthetic media containing the biomass either with AB and UB. As shown in Fig. 1a, the mycelial volume constituted 0.1 mL of the 1 mL UB culture on day 1, and it remained at this level until day 3. Conversely, the mycelial volume increased remarkably in the 1 mL AB culture, reaching 0.7 mL after 3 days (p < 0.01). 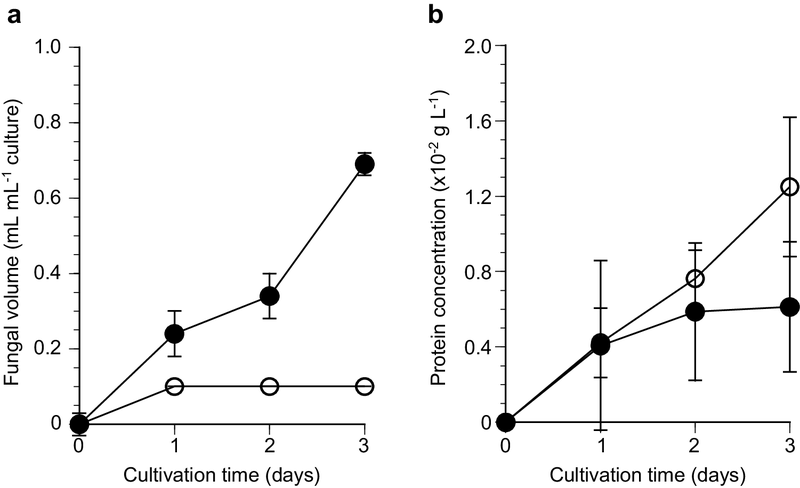 In the UB culture, 1.2 × 10−2 g L−1 of extracellular protein was secreted after 3 days of cultivation, compared to 0.6 × 10−2 g L−1 in the AB culture (Fig. 1b). Although the changes in protein concentration of the cultures were not significantly different after 3 days of cultivation (p = n. s.), ammonia pretreatment greatly enhanced the growth of P. chrysosporium. Cellulase, xylanase, and protease activity in the 3-day culture filtrates were measured and compared (Fig. 2). In the UB culture, 1.6 U L−1 of cellulase activity was measured after 3 days of cultivation, compared to 0.95 U L−1 in the AB culture (Fig. 2a). The specific activity of cellulase (activity/mg of total proteins) between AB and UB cultures was not significantly different (p = n. s.). This may be because the major proteins secreted by P. chrysosporium are cellulases. On the other hand, the specific activity of xylanase and protease were markedly increased in the AB culture compared to the UB control culture. Xylanase and protease activity increased 7.8- and 2.2-fold in the AB culture compared to the UB control culture (p < 0.01). Extracellular proteins in the culture filtrates were separated by 2DE (Fig. 3). For both UB and AB filtrates, most of the protein spots focused at a pI of 4.5–5.5, although their molecular masses ranged from 37 to 100 kDa. Of these spots, 55 spots were subjected to LC–MS/MS analysis (Table 1). These proteins were selected on the basis of the amount of protein and the sharpness of the spot. Most of the proteins were classified as CAZymes such as GHs (34 spots), CEs (10 spots), and AAs (3 spots). In addition, four thaumatin-like (thn) proteins and one aldose 1-epimerase (a1e1) were detected. Protein functional analysis showed that many of the proteins were cellobiohydrolases and endoglucanases participate in cellulose degradation, as well as xylanases and accessory enzymes participate in xylan degradation [14, 16, 18, 21, 22, 23, 28]. Spot numbers 5, 7, 9, 10, 11, 12, 19, 22, 24, 30, 35, 48, and 52 were identified in both the UB and AB cultures. The major spots corresponded to cellobiohydrolases (Cel6A: spot 5; Cel7C: spots 11, 12, and 13; and Cel7D: spots 7 and 9), endoglucanases (Cel5A: spot 4; and Cel5B: spot 2), and xyloglucanase (Xgh74B: spot 31). To investigate the effects of ammonia pretreatment on protein expression ratios, the normalized average volume of each protein spot in the AB culture was compared to that of the corresponding spot in the UB culture. For measured total protein in 2DE, 49% (UB culture) and 51% (AB culture) protein were identified. Cellobiohydrolases of GH family 7 were the most common extracellular proteins in both UB and AB cultures, accounting for 40% of total protein. In the AB culture, 10 protein spots exhibited more than double the normalized average volume compared to the corresponding spots in the UB culture (Table 2). Among them, both spot 22 assigned to the GH family 11 xylanase (Xyn11B) and spot 23 of the proteolytic product derived from Xyn11B were remarkably enhanced in the AB culture compared to that in the UB culture. In contrast, six other protein spots in the AB culture showed less than 50% of the volume of the corresponding spots in the UB culture (Table 3). Spot 20 assigned to the GH family 10 xylanase (Xyn10C) was decreased in the AB culture, while spot 19 of the proteolytic product derived from Xyn10C was increased in the AB culture. In addition, it was notable that both Xyn10C (spot 20) and Xyn11B (spot 22) have a type I carbohydrate-binding module (CBM I) connected to the catalytic domain by a linker region, while any fragment assigned to CBM I was not detected from their proteolytic products corresponding to spot 19 and spot 23 with a lower molecular weight. A part of Xyn10C (spot 20) and Xyn11B (spot 22), therefore, may have been proteolytically degraded in the AB culture (Table S1, S2 and Fig. S1, S2). Ammonia pretreatment is particularly effective for improving the enzymatic saccharification of lignocellulosic biomass from grass plants [3, 4, 5]. In addition, we have recently reported that ammonia pretreatment is also effective for improving the enzymatic saccharification of hardwood biomasses such as birch wood with high xylan and low lignin contents . The biomass recovery after ammonia pretreatment of birch wood meal was 99% and this pretreatment did not change the neutral sugar and lignin contents, while the content of nitrogen increased and the content of acetyl group decreased after ammonia pretreatment, suggesting that the acetyl substitution of xylan was eliminated by the cleavage of ester linkages during ammonia pretreatment . In the present study, we found that whereas protein secretion by P. chrysosporium was depressed in the AB, fungal growth was higher in the AB culture than in the UB culture. Although we must consider adsorption of enzymes to biomass residue, the above-mentioned finding indicated improved fungal digestion of the ammonia-treated biomass and catabolite repression of overall protein secretion during biomass degradation. Thus, this ammonia pretreatment process effectively enhances the hydrolysis of lignocellulosic biomass from birch wood. There has been great interest in finding an optimal enzyme that hold a key role in biomass degradation can not only enable the supplementation of commercially available enzyme mixtures, but also the design of tailor-made enzyme cocktails that can be optimized for each substrate [30, 31]. In the present study, we used comparative secretome analysis to examine the effect of ammonia pretreatment on the levels of proteins secreted by P. chrysosporium grown on birch wood meal. It is known that the concentration of nitrogen is the critical parameter for the production of lignin decomposition enzymes in P. chrysosporium . However, since we cultivated P. chrysosporium in Kremer and Wood medium  containing a high level of nitrogen source, detection of lignin-decomposing enzymes in the culture was precluded. In addition, protease activity was increased 2.2-fold in the AB culture compared to the UB control culture and the 2DE profiles of the AB culture revealed many low molecular weight proteins, which may be the result of protease-mediated cleavage during cultivation. For example, one of the spots corresponding to a GH family 10 xylanase (Xyn10C) was repressed in the AB culture, while other spots of Xyn10C were enhanced compared to the UB culture. This appeared to be mainly due to proteolytic cleavage of Xyn10C. Therefore, we considered that the total amounts of Xyn10C were essentially the same in the AB and UB cultures. On the other hand, increased concentration of a GH family 11 xylanase was noted when AB was used as the carbon source. Notably, GH family 11 xylanase is expressed by various white-rot fungi, including P. chrysosporium , which is known to secrete three endo-1,4-β-xylanases. Two xyn genes (xynA and xynC) encode GH family 10 glycoside hydrolases, whereas the third (xynB) encodes a protein in GH family 11 [34, 35]. XynA and XynC, corresponding to Xyn10A and Xyn10C in the present study, also showed activity toward p-nitrophenyl-β-d-cellobioside and p-nitrophenyl-β-d-xylopyranoside, whereas XynB, corresponding to Xyn11B in the present study, hydrolysed only xylan . In addition, XynA and XynC mostly produced products resembling xylobiose and xylotetraose, whereas XynB released products resembling xylobiose and xylopentaose . We previously observed a strong induction of Xyn10C in soluble xylan from oat spelt-containing cultures, whereas the production levels of Xyn11B was unaltered . Xylan in oat spelt has α-l-arabinose side chains, whereas that in birch wood has additional side chains of 4-O-methyl-β-d-glucuronic acid. Although the lack of response to oat spelt appears to conflict with the results of our present study, a plausible explanation may be that P. chrysosporium recognizes changes in the structure of xylan on modification and solubility during ammonia treatment, leading to the enhancement of Xyn11B production. Notably, supplementation with the commercially available GH family 11 xylanase from Neocallimastix patriciarum significantly increased the yields of both glucose and xylose from AB of birch wood . The previous results of enzymatic saccharification show a good correlation with the present results. Furthermore, ammonia treatment of the biomass reduced the concentration of GH family 74 xyloglucanase (Xgh74B), GH family 28 polygalacturonase (Rgh28C), AA8–AA3 cellobiose dehydrogenase (CDH), and CE family 1 acetyl xylan esterase (Axe1). Notably, in a previous study, we found that the production of these enzymes was enhanced, rather than reduced, when soluble xylan from oat spelt was added to a cellulolytic culture . These results support the idea that P. chrysosporium employs complex, so-far-unidentified mechanisms for recognition of its environment. In conclusion, we used the comparative secretome analysis to examine the expression levels of proteins secreted by P. chrysosporium grown in UB and AB cultures. In the AB culture, relative production of Xyn11B, as a key enzyme for enzymatic saccharification of xylan, was increased. While relative production of Xgh74B, Rgh28C, CDH, and Axe1 decreased. The ammonia pretreatment promoted proteolysis of Xyn10C, leading to a loss of family 1 carbohydrate-binding modules. These results indicated that P. chrysosporium produced enzymes related to recognition of structural changes on xylan with de-acetylation and introduction of additional nitrogen by ammonia pretreatment of birch wood meal. However, the complex mechanism that P. chrysosporium recognizes and regulates its enzymes is still unknown. Further studies on the enzymatic saccharification of the ammonia pretreated biomass from birch wood using a defined enzyme cocktail from P. chrysosporium might provide clues leading to a better understanding of the complex mechanisms of biomass degradation by P. chrysosporium, as well as being helpful for optimizing enzyme cocktails for efficient saccharification towards the production of biofuels and biochemicals from lignocellulosic biomass. The authors are grateful to Shuichi Mihashi, Reiko Hayashi, and Aiko Akiyama for analysis of the two-dimensional electrophoresis and chemical composition data. This research was supported by: a Grant-in-Aid for Scientific Research (no. 23248025 and 16H04949 to M.S.) from the Japan Society for the Promotion of Science (JSPS). K.I. thanks the Finnish Funding Agency for Innovation (TEKES) for the support of the Finland Distinguished Professor (FiDiPro) Program “Advanced approaches for enzymatic biomass utilisation and modification (BioAD)”.